Kojo recently obtained a PhD from the Global Development Institute at the University of Manchester, and is a researcher with ESID. 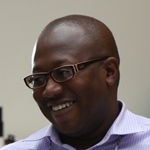 He is also a Senior Research Officer at the Ghana Center for Democratic Development (CDD-Ghana). Kojo’s research focus is the politics of development, particularly the role of coalition politics and the implications for development outcomes. For ESID Kojo is focussing on the role of politics in shaping the outcomes of natural resource-led development, particularly oil and gas. Mohan, G. and Asante, K. P. (2015). ‘Transnational capital and the political settlement of Ghana’s oil economy‘, ESID Working Paper 49. Manchester. Mohan, G. and Asante, K. P., ‘Transnational capital and the political settlement of Ghana’s oil economy‘, ESID blog, 7 July 2015. ‘Local-national bargaining over oil and gas resources and its implications for inclusive development’, PhD thesis.